Practice Session Used for Millwall Lionesses FC Reserves, September 2012.
to get them used to the movement and options available. end pass must be to a mannaquin or between poles - whichever is there. Work on technique - correct body position to receive, motivation to move to become an option & creation / use of space. 2 Strikers & 2 CM are introduced for the opposition. Managing the Opposition - Their tactics will be to play as a narrow 4, making play predictable, so shadowing the Blue team, cutting off angles and opportunities to play forward. NOTE: If there are issues with numbers, Coach will feed the ball into CB, or Defenders will play as 3 CB. 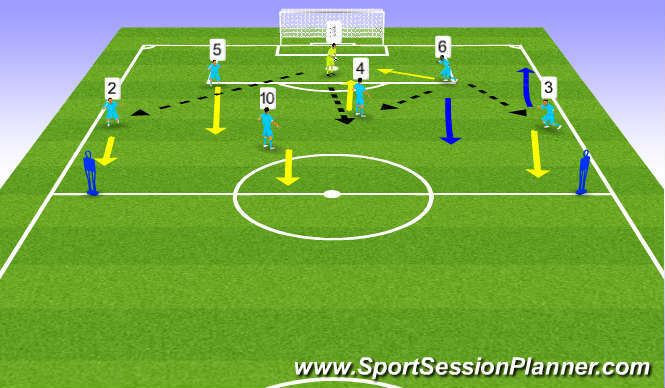 #5 & #6 look to drop deep & one will collect from GK - try to collect at an angle to encourage vision of team mates & opposition & to make it less complex to physically move forward. Q. CAN THE #5 or #6 DRIVE FORWARD? #2 & #3 are high & wide - at an angle which means they have created either an aerial option to receive or a firm pass from the GK's hands / feet.